Why we need faster speeds and bigger bandwidth. Last month I wrote about the difficulty in doing a cost benefit analysis of something that is potentially as ‘nation-building’ as the NBN, and I received some great feedback and comments from you on the back of that piece. I’ve continued to think about both the pros and cons about the rollout, the negatives being around the execution and politicisation of the NBN, versus the positives that it can bring to us all. I started to think of some of the more underlying benefits that this project can and should bring to us in our modern world, which requires essentially instant communications, live ‘everything’, and information at our fingertips, and some of the benefits that this can bring to our everyday lives. I touched on my relatively large family last issue, but try to imagine if you can a household with two parents, one adult son, and three other boys under the age of eleven, putting us at six in the household (my twenty-one-year-old son doesn’t live at home). It’s a place of mobiles, laptops, tablets, computers, games consoles, smart TVs, an AV system, smart watches, wireless speakers, cameras, our washing machine (yes the washing machine is online and sends me alerts when its finished its cycle, as well as when it needs a clean), not to mention the venerable old wireless printer. In fact the list goes on and on, to the point where, as I quickly check my app that shows me how many devices are connected to my router on this fine Sunday morning, there are no less than 28 connected devices on my home network. I guess I’m what’s called a Prosumer, as, according to Telsyte in their recent 2017 Australian IoT@Home Market Study, the average Australian home right now has 13.7 connected devices, and is heading for more than 30 by the year 2021. As a wakeup call though, 2021 sounds a long way into the future, but it’s less than four years away. So I’ve shared that I have a plethora of devices on my network, and a rather busy household on the best of days. So what? Does this provide me with some insight into the future of Australia’s broadband and Internet requirements? Actually, it does because I’m ahead of the ‘average’ user in terms of connected devices already, so I can offer some context on what the average person might get frustrated by in the next couple of years as they head towards 24 (or more) connected devices online at any one time in their own household. In September, I sent and received over 600Gb of data, much of this downloaded at over 100Mbps thanks to my ultra-fast cable connection. 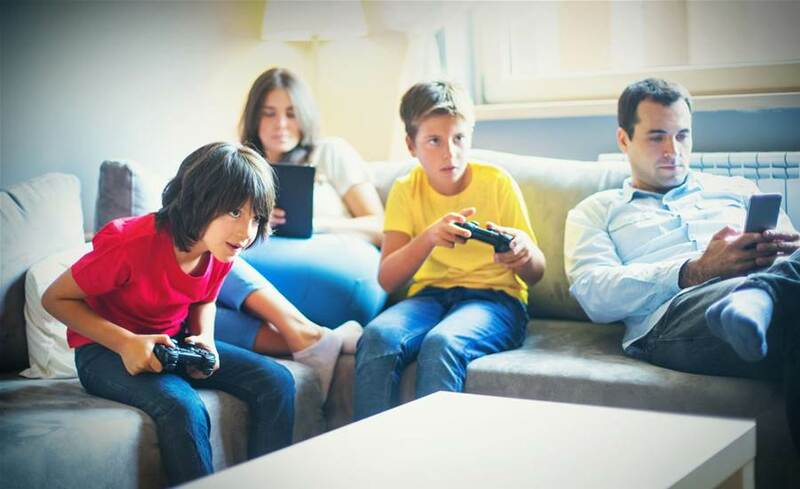 My point here is that my kids aren’t downloading Blu-ray movies, they are watching Netflix and YouTube videos, playing online games, and they are (seemingly non-stop) on social media. I’m having video conferencing calls with team members around the country for work if I happen to be at home, have cameras in various spots around the house, have the laptop continuously connected over VPN into the office, and my wife is listening to George Michael tracks over Spotify whilst checking out the latest recipes for various amazing dinner suggestions onto her iPad. Imagine the sort of data requirements and data transfer speeds I’ll need when my car starts telling my air-con that I’m on the way home, and that my security system should turn itself off just as I arrive, or that the ice-cream in the fridge has run out and we won’t receive any more for four days from our online shopping service! It’s these ever-increasing demands on our time, the data we need and the fact that we almost always crave instant gratification that the NBN when complete and running right, will help us serve. I’d love to hear from you on how many devices you have at home, what sort of data you’re using, and what your pain points are within your networks as there’s a strong chance I will have been there and can help. Thanks for reading. Graeme Reardon is the Managing Director of D-Link Australia and New Zealand and has had over 20 years’ experience working with major networking brands including Cisco. Graeme has a borderline obsessive passion for all things IT-related.